Translate the text selected as part of your Class 2 assignment. This test will be graded (not on the quality of the translation, but on the work done in externalizing the experience. About 250 words each person. Read chapter in "Becoming a Translator" about the process of translation, and Chapter 3 of "How To Succeed As A Freelance Translator"
In the real world, in several countries, most translators translate by necessity from their native tongue into foreign languages"
...and you're okay with this? I fear you, as an educator, are part of the problem by presenting this practice as if it were a given standard. Or did I miss something? I'm not normally OK with this (i.e., with translating into a foreign language). 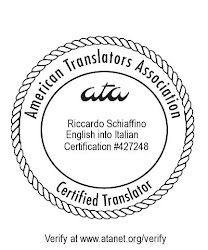 2) What I'm saying in the passage to which you refer is a description of what currently goes on ("in the real world [...] most translators [...]). I don't think this can be construed as my advocating translating from one's mative tongue into a foreign language. Perhaps you could be more explicit about business behaviour of freelance translators. How to communicate with PMs, no extensive telephone communication, all part of agreement in written form only, PM is not your buddy, s/he has to manage maybe 20 languages at the same time in different projects etc. Don't complain about the end-customer. Deliver on time always, rather early than at the deadline sharp. That will increase the chance to get more work in the future. I will certainly bear in mind your suggestions for future courses (and also if I'll expand these outlines to something more useful for people studying on their own). Thank you.